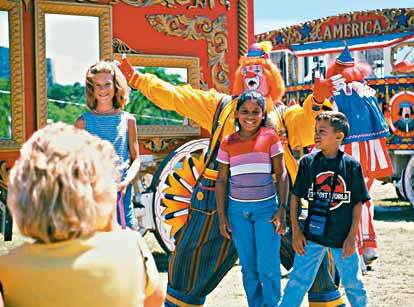 Wisconsin's Circus World Museum juggles circus history and exciting performances with acrobatic flair. Showman P.T. Barnum would feel right at home at the Circus World Museum in Baraboo, Wisconsin, where colorful circus history shares the center ring with classic family entertainment. The museum stands on the grounds of the Ringling Bros. Circu's original winter headquarters and is the largest circus-history facility in the world. It was a real treat for our kids, who are used to video games and television. The museum showcases the history of the Ringing Bros. and Barnum & Bailey circuses with numerous exhibits, including the world's largest collection of circus wagons. The 200-plus wagons are eye-catching works of art dating back to the days when circuses traveled from town to town. You can view the wagons year-round on guided tours. In summer, the Big Top hosts great live performances. Our girls giggled at the clowns and performing dog, and we all gasped at the high-flying trapeze aerialists. Kids can also ride an elephant, antique carousel, circus wagon and tiny circus train, or tour the grounds aboard the trolley. We enjoyed catching behind-the-scenes glimpses of circus life, such as elephants bathing and playing in the Baraboo River. As we watched workers load a train, we realized that “moving” a circus is a lot of work! The kings of the circus may have left Baraboo in 1918, but the Circus World Museum keeps alive the legacy of “the Greatest Show on Earth”. Baraboo is on State Highway 33, a few miles east of U.S. Highway 12 and roughly 40 miles northwest of Madison. The Circus World Museum is just blocks from the town square. It's open from 9 a.m. to 6 p.m. daily, except major holidays. Circus shows run from early May through Labor Day weekend. Admission, which includes everything except rides, varies by season and ranges from $7 to $14.95 for adults and $3.50 to $7.95 for children ages 5-11. The Wisconsin Dells area, famous for its scenic Wisconsin River boat tours and theme parks, is about 15 miles north of Baraboo. To learn more call the Wisconsin Dells Visitor and Convention Bureau at 1-800-223-3557. Frank Lloyd Wright's home, Taliesin, is about 40 miles southwest of Baraboo, near Spring Green. For more information telephone 1-608/588-7900.